From Twitter to the room where it's all happening, lawmakers and celebrities alike are reacting to the vote on Judge Brett Kavanaugh. People across the nation watched on edge Thursday as Supreme Court nominee Brett Kavanaugh and Christine Blasey Ford, who has accused him of sexually assaulting her in high school, testified before the Senate Judiciary Committee. In the early 1980s, when Ford was 15 and Kavanaugh was 17, Ford alleged that Kavanaugh, while intoxicated, pinned her to a bed during a house party in Maryland and attempted to remove her clothes. She also claims he put his hand over her mouth when she tried to scream. Ford asserted these accusations during the hearing, saying at one point she is “one hundred percent” certain Kavanaugh assaulted her. Later, Kavanaugh would deliver a fiery and, at times, tearful testimony, where he vehemently denied the claims against him. Ford's supporters commended her for bravery, while Kavanaugh’s backers — namely Sen. Lindsey Graham, R-S.C. — tore into Democrats. But in Thursday’s aftermath, at least two Republican senators and two of their Democratic colleagues appeared to remain undecided on whether or not they would vote to confirm Kavanaugh. Sen. Jeff Flake, R-Ariz., one key lawmaker who was still undecided after the hearing, announced Friday he intended to vote to confirm Kavanaugh. But that support came with a caveat, as Flake said he'd only be "comfortable" moving on the floor if the FBI investigates further. If Flake remains a “yes,” however, there would be 48 pledged Republicans, with Sens. Susan Collins, of Maine, and Lisa Murkowski, of Alaska, the two remaining wild cards. Sen. Mike Enzi, R-Wyo., hasn’t announced his stance but wasn’t expected to stray from party lines. Collins and Murkowski, along with Democratic Sen. Joe Manchin, could vote in a bloc. A source told Fox News that Collins, Murkowski and Flake huddled with Manchin on the sidelines of Thursday’s hearing to discuss the nomination. They spoke for 30 minutes. Collins has previously expressed concern a more conservative judge on the Supreme Court could threaten Roe v. Wade. Recently, however, she announced she does not believe Kavanaugh, if approved and appointed to the nation’s highest court, would threaten the ruling. Following Thursday’s hearing, however, it’s still not clear if Collins found Ford’s testimony credible. Murkowski still remained undecided after the hearing and had previously noted the importance of listening to accusers in sexual assault cases. All eyes on the Democratic side of the aisle turned to Sens. Joe Manchin, of West Virginia, and Heidi Heitkamp, of North Dakota. Heitkamp was still undecided. She voted for Trump’s other Supreme Court pick Neil Gorsuch, but also expressed the importance of listening to Ford during her testimony. “It takes courage for any woman to speak up about sexual assault, and we need to respect Prof. Ford by listening to her and hearing her story,” she said in a tweet last Monday. Meanwhile, Manchin met with Collins, Flake and Murkowski on the sidelines of Thursday's hearing. He was still undecided after the hearings. As far as meeting with his Republican counterparts, Manchin insisted they were friends and that no decision had been made despite rumors they could vote in a bloc. Democratic Sens. Joe Donnelly, of Indiana, and Jon Tester, of Montana, who were considered as possible swing vote candidates, decided they were going to vote against Kavanaugh. 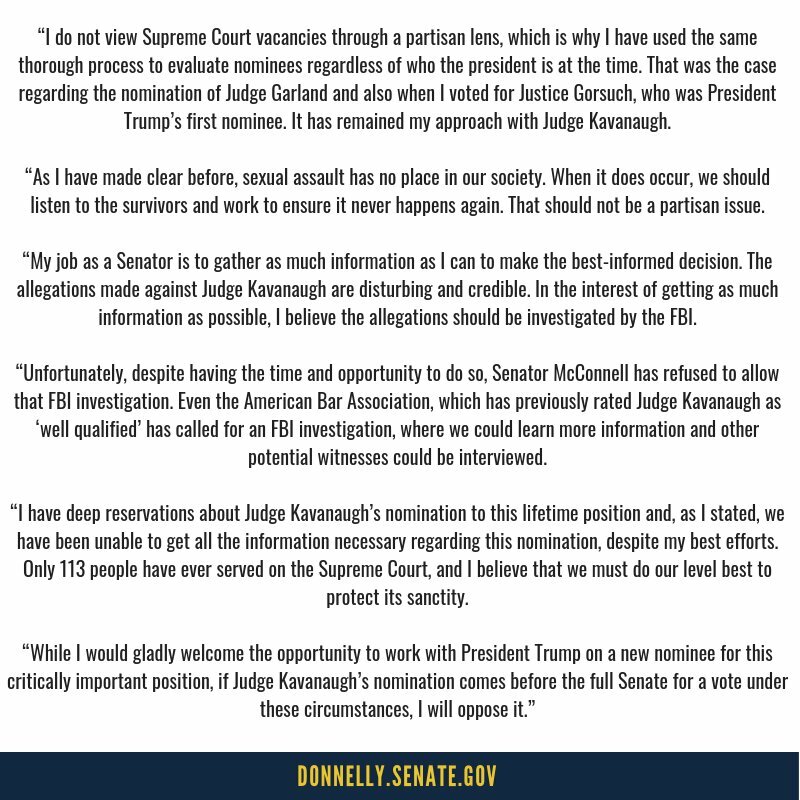 Donnelly announced early Friday he was going to oppose Kavanaugh during confirmation voting. Tester followed suit hours later, announcing he was not going to vote for Kavanaugh either. He cited what he heard in the hearings in his statement. "I have deep concerns about the allegations of sexual assault against Judge Kavanaugh … the only information I have is from what he said in his hearings. I'll be voting against him," Tester said. The Judiciary Committee voted Friday to send Kavanaugh's Supreme Court nomination to the full Senate, even as Republican Sen. Flake backed a floor vote delay so a FBI probe could be conducted. Fox News’ Brooke Singman, Adam Shaw, Kaitlyn Schallhorn and the Associated Press contributed to this report.